This is the fourth in an on-going series of “playlists,” in which we recommend books around a particular theme. For us here at Englewood Christian Church, one of the most powerful practices of gratitude is our journey of Asset-Based Community Development (ABCD). 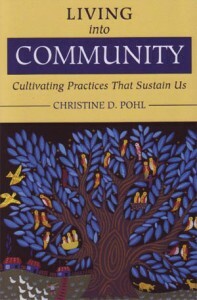 There are a number of John McKnight’s books that one could read to be introduced to ABCD and its deep roots in gratitude, but The Abundant Community is probably the most accessible; it stirs our imaginations with the possibilities of what it might mean to really be grateful for our neighbors and to seek an abundant and flourishing community together with them. The figures at the far end of the city park I was about to enter, lurking just outside the bright cone of a streetlight, had the hulking, rounded look acquired by homeless people wearing many layers of clothing. I assumed I would know the two people, and so personal safety never crossed my mind – I’m a pastor and member of the Sanctuary community, which makes a particular point of embracing people who are, as we say, “street-involved”. In other words, most of the “bad guys” are my friends. As it turned out, these two were men I have known for years. It wouldn’t be a stretch to say that we love each other like brothers – brothers in a large, fractious, family where addictions and violence are too common. We stood there in the cold dark bantering about nothing in particular. My pals were sober and at ease. They weren’t in a rush to be anywhere else; that little park was, in effect, their living room, and apart from some of the more colorful expressions, the tenor of the conversation was pretty much what you’d hear at a neighborhood dinner party. The low sun fainter shines. O living friends who love me! O dear ones gone above me! I leave to you my name. Most gracious God, by whose knowledge the depths are broken up and the clouds drop down the dew: We yield thee hearty thanks and praise for the return of seed time and harvest, for the increase of the ground and the gathering in of its fruits, and for all other blessings of thy merciful providence bestowed upon this nation and people. And, we beseech thee, give us a just sense of these great mercies, such as may appear in our lives by a humble, holy, and obedient walking before thee all our days; through Jesus Christ our Lord, to whom, with thee and the Holy Ghost be all glory and honor, world without end. Amen.